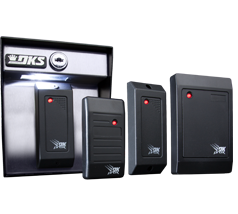 DoorKing offers the following proximity card reader products: DK Prox, HID and AWID proximity card readers, all of which are compatible with the 1830 Series access controllers. All readers feature a cosmetically appealing design that will blend with any architectural design and offer high durability and reliability. AVI (or Automated Vehicle ID) systems operate in the same manner as proximity card systems, but with longer ranges. A typical AVI system places a tag on the vehicle, rather than having the user carry it. In this manner, a gate system will open automatically as the vehicle approaches with a properly credentialed tag. This provides convenience and is ideal in applications where only authorized vehicles are allowed entry.